For the best Philly cheese steak or grilled chicken sandwich in Durango made by two guys that are genuinely from Philadelphia go visit Good on the Bun hot dog stand in the Downtown Smoke Shop parking lot on Main Ave.
Markus Chesla and Tom Corrado at Good on the Bun cook up some marvelous food to keep your mouth happy. 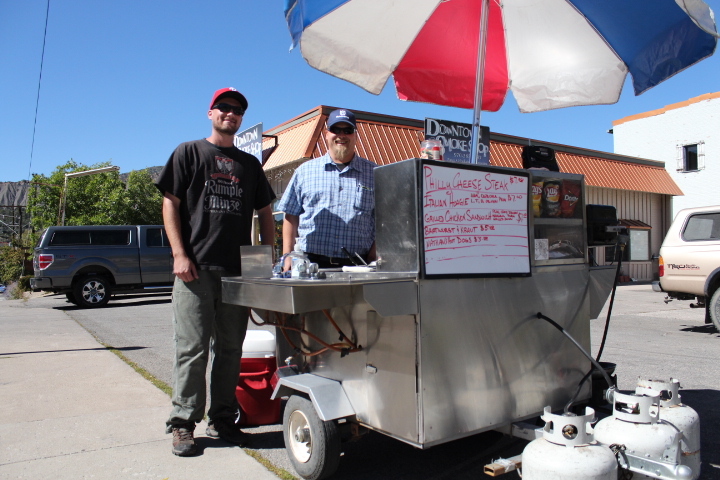 Since last October, Markus Chesla and Tom Corrado have been serving Durango up with Phillies, hot dogs and brats every day as well as a homemade soup and sandwich menu that changes weekly. They use Nathan’s all beef hot dogs, Sheboygan Brats, rolls from Philly, roasted green chillis, organic arugula and sauteed onions, among other condiments. They’ve got chips and drinks to sell with it. Operating Tuesdays through Fridays from 10:30 to 3:00 p.m., these guys will be working through the winter in downtown Durango in addition to catering food for special events such as backstage catering for performers at Planet Bluegrass, said Corrado. 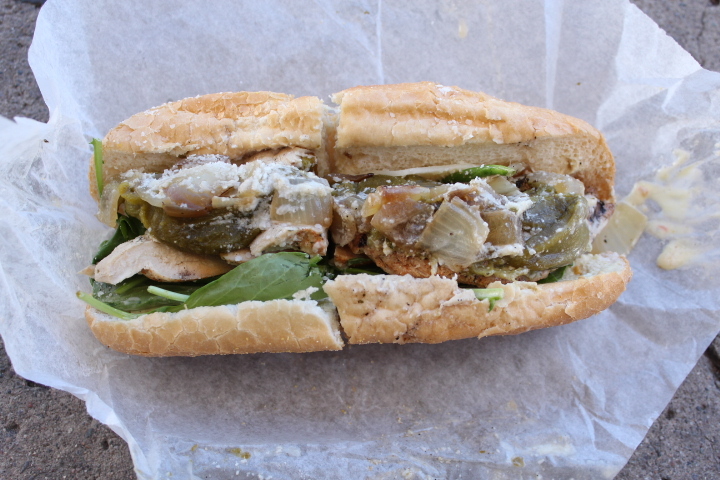 A grilled chicken sandwich from Good on the Bun hot dog stand in Durango, Colorado. Of everything that they serve, the Philly cheese steak sandwich is the most popular, said Chesla. This blogger has tried the Philly cheese steak, the grilled chicken sandwich and a hot dog from their stand on separate occasions. It’s all good and fast!